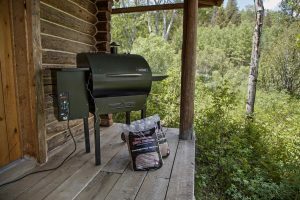 The Camp Chef PG24 Pellet Grill and Smoker BBQ is for food lovers who love slow cooking and smoky flavors at the comfort of home. It is one of the best outdoor cooking units and owning one makes even an amateur owner look like a pro. The manufacturer has kept in mind all the types of cooks and designed the BBQ in such a way that it is very easy even for an amateur cook to operate it. There are many built-in features that make cooking fun. Pellet Grill users will certainly find the features of this grill very useful because it is certainly better than the other grills in the market in terms of giving a clean flavour, less ash, controllers that make you set and forget all about it and still finally get an excellent food. Few of the features worth discussing are the built-in thermometer and the heat sensors that help in maintaining the temperature of the food while cooking, the capacity of the hopper for filling enough of fuel and a sturdy unit. 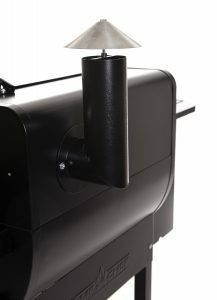 The Pellet unit has an unbeatable advantage against the wood, charcoal and gas units in the case of temperature control. Another thing worth mentioning is the unit’s warming rack and the ash catcher. When it is quite tough in other BBQs to clean up the ash, the unique ash catcher design makes it easier to clean up all the residual ash at the end of cooking. 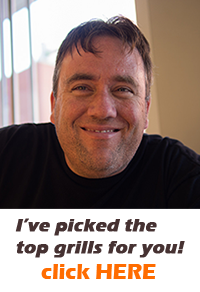 This Pellet Grill Review is aimed at reviewing all the best features in detail, highlighting the product’s worth against all its competitors and at the same time, mentioning negative points, if any, that is worth noting. Camp Chef PG24 Pellet Grill and Smoker BBQ is worth the money spent. It is of great value at the reasonable price. Its easy-to-use features makes it the leader in market. Not only are the features easy-to-use, but they are also on par with the sophisticated products in the market. The innovation is quite good and the features (where a lot of thought process has gone into) are sure to capture the attention of all food lovers. Here is the Pellet Grill Review on its’ Best features. Assembly: The assembly of the Pellet grill is quite simple. It doesn’t take more than an hour to assemble it and make it ready for use. There are few points worth noting while looking into the assembly of the grill. The parts are all easy to fit. The fittings are exact and the manufacture is of good quality. There is an assembly manual which helps the user in the assembly process. And it is complete with all the steps. The engineering of the assembly has been well thought through and there is no much effort needed for the assembly. A tip to follow during assembly is to wrap a tray with foil. This would facilitate the cleaning up process. There are only a few things that needs assembly. 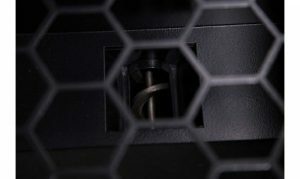 For example, the grill already comes with hopper and fan, along with the wires. The only things that need to be assembled and tightened are the chimney, the lid handle, the shelf and the legs. LED Digital Temperature Control: With the help of the Digital Temperature Controller the temperature is regulated so that an even heat is maintained all the time. This makes the Grill work like a convection oven, thus, eliminating the inconsistent temperature at different places. The food is thus cooked evenly. Whether it is smoking meat for long hours at low temperatures, or grilling and searing food by turning up the temperature up to 350-500 degrees. The two different smoke settings in the temperature is easy to use and for safety, there is also a shutdown feature. The temperature control is flawless and makes the cooking process so easy. Stainless Steel Food Temperature Probe: There is no point in opening the cooking chamber often and checking the temperature of the meat. This pellet grill is an intelligent design where there is no need to allow the smoke and heat to escape. There is a temperature probe inside the cooking chamber which takes the reading of the cooking meat and thus, allows the user to keep track of the temperature. So, there is no need to get worried about the external temperature that would dry the meat as the camber need not be opened till the meat is cooked. Also, keeping track of the meat’s temperature with the help of the built-in temperature gauge means that the food is cooked properly every time the grill is fired up. Removable Upper Racks: There is no space constraint and the Upper rack can be used without any cramp. It is removable and can be removed when not needed and the removable feature helps out a big deal during cleaning. Automatic Auger: For improving the efficiency of the smoking, there is an automatic Auger that dispenses pellets when it is necessary. What the user needs to do is simple. Just feed the pellets in the unit, set the temperature that is desired, add the food to be smoked and leave it to the machine. Cooking Area: The design of this Pellet Grill is such that it has a large cooking area. The smoke rack has been placed at the back of the unit. It has been thoughtfully placed that way so that the right side of the unit even if you use the smoke rack. 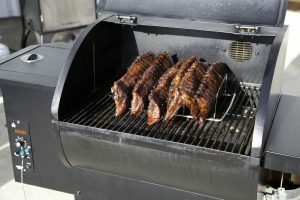 In other Pellet grills, the smoke stack is usually to the right. This prevents the user from using that area while smoking any food. Camp Chef PG24 is designed cautiously so that the user can use the entire area efficiently. Also, unlike other grills (that are circular in shape); Camp Chef has a squared backside, thus creating plenty of space for cooking. Cleaning System: Cleaning up a Pellet grill has never been easier. A pellet grill user is the one who know how tough it is to clean the grill of all the ashes once cooking is finished. The Camp chef has a burn pot that is very easy to access. When a lever is pulled, the ash automatically falls into the cup under the firebox. It is that simple. There is no need to take the grill apart to clean the ashes out. The clean out of pellet is also very simple. With a hopper that is large enough, switching between different pellets is very easy. The large capacity of the hopper makes cooking efficient – more smoking with lesser filling of pellets. Accuracy of temperature Control: The temperature control isdigitally controlled and hence, high temperatures are reached with accuracy. Though there are many Pellet grills available in the market which can smoke food, they have problem reaching high temperature. But Camp Chef’s Pellet grill reaches high temperature with ease and accuracy that you can not only smoke food, but also sear and grill it. It shows the versatility of the product. Power Outage Bypass: This feature is worth mentioning in the Pellet Grill Review. 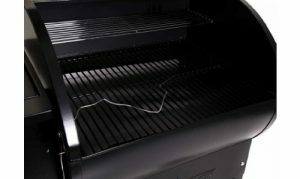 The relight feature in this Grill can be bypassed at any time when the power goes off. By bypassing the feature, the wear and tear of the hot rod is minimized and saved. This is a feature that goes unnoticed quite often but worth the mention in this review. There are few negative points to discuss but all are certainly trivial. The Camp Chef PG24 Pellet Grill is certainly of great value for the money. Some of these points must be validated against the user’s requirement as some users may not find it as a problem at all. The user is finally the better judge. The shape of the pellet grill is barrel shape and is old fashioned. As this is an outdoor unit, it is very tough for the appliance to reach the desired temperature if the weather is windy. This point is worth noting because the desired result is not achieved during such windy days. There is a warranty period of only one year. While other brands give a warranty of three years, one year is quite less. But the product didn’t have much problem and the customer support are good enough to help with problems in the appliance. The grate has to be removed to get the pellets out of the hopper. Sometimes, ashes are blown to the bottom of the Grill and needs vacuuming to clean them all out. The Automatic Auger is certainly an excellent feature as the user can carry on with other chores after setting the instrument. But sometimes, there is a small mechanical defect that prevent the last few pellets from dispensing. Though not a negative, it is better to keep an eye on it while doing other chores. 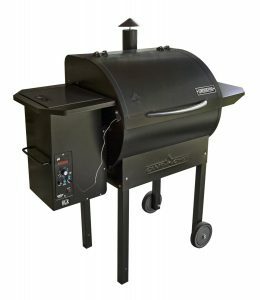 People choose a pellet grill and smoker because unlike conventional smokers, pellet smokers are easy to use. Effort put into smoking is very less in pellet smokers compared to other conventional smokers. Using the best pellet Grill means that the user has perfect control over the production of temperature and smoke. When the temperature and smoke is perfect, the food is juicy and bursts with flavour. Camp Chef is one such grill and it can be selected taking into account the following factors. The instructions given by the manufacturer is very clear. Instruction Manual is given along with a recipe booklet. The assembly is quite simple compared to other market players. By just looking at it, one can say that it will last long. Made out of steel, it is rigid and weighs more than its competitors but it is rock solid. The cooking space is 560 cubic inches and is quite comfortable to cook with. Also, the smoking rack has been placed at the back of the unit unlike others, where it is placed to the right. Placing the smoking rack to the back of the unit adds more space for cooking. The hopper is a large capacity hopper and it means that it can be filled with as much as fuel wanted. It also aids in changing the pellets. The automatic dispense of pellets is also an advantage as the pellets are automatically dispensed till the cooking is over without human intervention. The Clean-up process in this Pellet grill and smoker is also innovative. The ashes are removed with just a pull of a lever and collected under the firebox. The LED Dual temperature display both the temperature of the chamber and the temperature of the food. So, there is no hassle in opening the chamber quite often to look at the temperature of the food being cooked. The temperature control sensors maintain a consistent temperature. It is not pricey and certainly suits the user’s pockets. The durability is also very good and, costly repairs and maintenance are not required. The Customer Care helps a lot in guiding the customer. Overall, the Camp Chef PG24 Pellet Grill and smoker has all the innovative elements to capture the market’s attention and at the same time, cater the needs of the audience. The Camp Chef PG24 Pellet Grill and Smoker BBQ is perfect for people who want to take their grilling and smoking skill to a professional level. Though this is the company’s first attempt to build a pellet grill and smoker, there has been much thought put into the design of this unit. With features that control the temperature automatically, there is no need for the user to keep an eye on the food all the time. The large capacity and the design of the unit is suited for cooking a decent quantity of food without any difficulty. For people who are lazy about the cleaning process after the cooking, Camp Chef is best suited as it has a beautifully designed cleaning system. The built is sturdy and would certainly last longer. The price is reasonable, the features are on par with that of a sophisticated, expensive Pellet grill and the results are amazing. What’s more? It’s a great worth for the money spent. Enjoy the art of cooking, smoking, grilling and barbecuing with this wonderful magical product of CampChef!